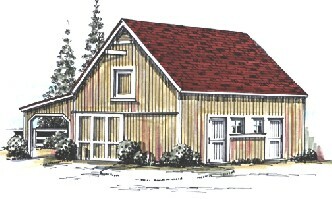 The Chestnut Three-Stall Barn has10'x12 stalls. A 10'x12' roof provides a sheltered outdoor area for grooming. Future expansion is easy with more stalls, a garage or workshop across the back. Floor Area: 480 Sq. Ft., Shelter Area: 120 Sq. Ft. Loft Area: 420 Sq. Ft., Ridge Height: 20'-4"